So, I totally wasn't going to write anything for this year's Blog Action Day. Not because it's a cause I don't believe in ... but rather because, honestly, what more could I add to some of the amazing things that have already been said? And then on the drive home I found my inspiration. Being that it's a mere week till I'll be heading off to the airport with my bags packed to the brim with winter woolies for probably the longest trip of my life so far (well, at least on a par with the time it took me to get from Cape Town to Joburg!) and that it's Blog Action Day today, it seemed pertinent that an article on the news was about the Arctic ice cap vanishing completely in summer months within 20-30 years. And I won't lie, that's another contributing factor to me doing my trip now ... although Churchill is not quite an Arctic ice caps, it's about as close as I am likely to get in my lifetime! And I certainly don't want to miss the opportunity of seeing these amazing animals in their natural habitat, while they still have one! They're there waiting for the ice to freeze so that they can go hunting because they prefer to remain on the sea ice where they hunt their main prey of seals. So maybe it sounds like they'd be easier to see if Hudson Bay didn't freeze, but actually what it would mean is that they get to hunt less and would struggle to survive at all without their hunting grounds. As it is, all the Hudson Bay bears must come ashore for about 3-4 months when the bay melts completely. During this period of time, the bears are not actively hunting, therefore they must survive on fat reserves that they have built up through the winter. Apparently, they can lose up to half their body weight during this time. Polar bears also mate out on the sea ice in the spring. The global polar bear population is currently relatively stable. However, in 2006, the World Conservation Union (IUCN) upgraded the polar bear from a species of Least Concern to a Vulnerable Species. It cited a "suspected population reduction of >30% within three generations (45 years)", due primarily to global warming. And as I said before, The key danger posed by global warming is malnutrition or starvation due to habitat loss. 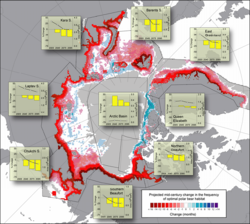 The image above is straight from Wikipedia (if you want to see a larger image) and shows projected changes in polar bear habitat from 2001–2010 to 2041–2050 based on data from the U.S. Geological Survey. Red areas indicate loss of optimal polar bear habitat; blue areas indicate gain. Imagine if this ice which the Polar Bears are so reliant on were never to refreeze because of rising temperatures? That could be their future. Thanks to Churchill Northern Studies Centre and Wikipedia for the more detailed information on Churchill Polar Bears. Have you seen the Earth movie that's on circuit at the moment? The polar bears are the central characters and it's tragic to see the effect of global warming on their lives.